Hey OKC fans! 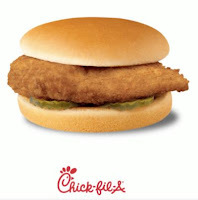 Stop by your local Chick-fil-A Restaurant next Tuesday, Feb. 5 from 5-7 p.m. and receive one free Chick-fil-A Chicken Sandwich. Share if we'll see you there! *Limit one free sandwich per customer. No purchase necessary. Available in-store and in the drive-thru.